We’ve gotten great feedback about our book Austin, Texas: A Photographic Portrait, and humbled and honored by the great response so far! Below you can find a sample of the praise we’ve received via social media from both fans and strangers alike. 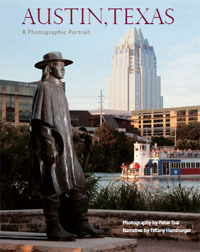 Enjoying “Austin, Texas: A Photographic Portrait” by @supertsai Gorgeous book! Go get one. Thanks for reading through the testimonials. Click on the following links to learn more about the Austin book or find out where to purchase Austin, Texas: A Photographic Portrait.